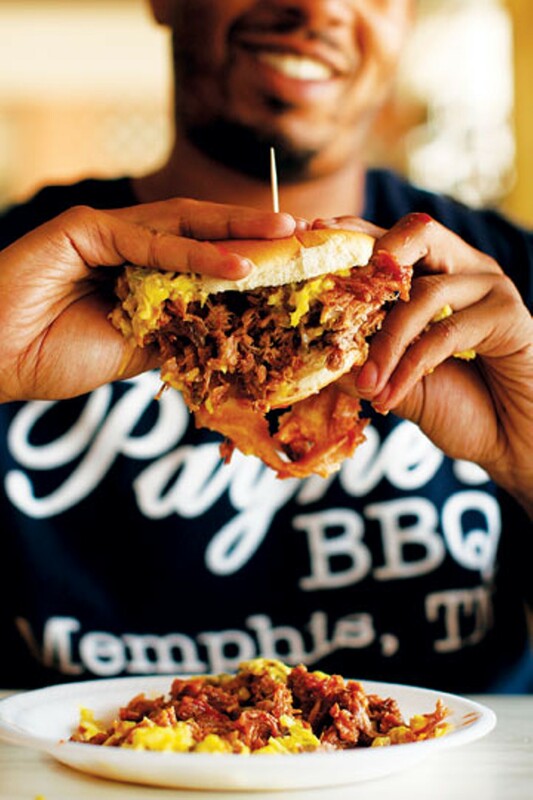 Some barbecue restaurants in Memphis are nationally known brands (Rendezvous, Corky's, Neely's), and some are the kind of authentic mom-and-pop shops that hipsters, writers, and barbecue connoisseurs like to wax romantic about (Payne's, Cozy Corner). The Bar-B-Q Shop, a comfortable Midtown restaurant owned and operated by Frank Vernon and his son Eric, lies somewhere in between. But it may well be the best barbecue restaurant in the country's preeminent barbecue city. Or at least the amateur barbecue judges around the Flyer offices think so. A year ago, six of us (Greg Akers, Tess Bailey, Mary Cashiola, Chris Davis, Bruce VanWyngarden, and me) volunteered time, mind, and stomach in pursuit of the city's best ribs, a contest the Bar-B-Q Shop won in a tight vote over Leonard's. This year, in seeking to crown the city's best barbecue pork sandwich, we added two more judges (Mary Helen Randall and Hannah Sayle) to the original six and spent a month surveying a dozen of the city's top 'cue joints. This time, the Bar-B-Q Shop won again — and decisively. It wasn't everyone's favorite sandwich (getting top scores from three of eight judges, with three first-place scores for Germantown Commissary and two for Payne's), but it was the only sandwich that every judge loved. A little historical perspective: Ten years ago, a different set of Flyer judges also crowned the Bar-B-Q Shop the city's top sandwich. The consensus choice, topping 40 points on seven of eight ballots, its "low" score a still-strong 38.5. The Bar-B-Q Shop's sandwich scored well in every category, but the key to its dominance was the universal love our judges professed for the restaurant's Dancing Pigs sauce, which is perhaps the most distinctive in town. The Bar-B-Q Shop's cumulative 71.5 sauce score was the highest any sandwich got in any individual category. The Bar-B-Q Shop's chopped pork is "very good, but not the best I've had," one judge wrote, before pivoting: "But the sauce is the best. Love it. Doesn't taste like any other." More than one judge noted that the Bar-B-Q Shop sauce — a little thinner than the more molasses-y sweet sauces that dominate the local scene and with perhaps a faint mustard quality — seems to be transformed by its contact with the meat. And that also goes for the restaurant's intense hot sauce. "The hot sauce is incredible," one judge gushed. "Punishing fire; perfect sweetness. A balancing act Philippe Petit might be proud of." 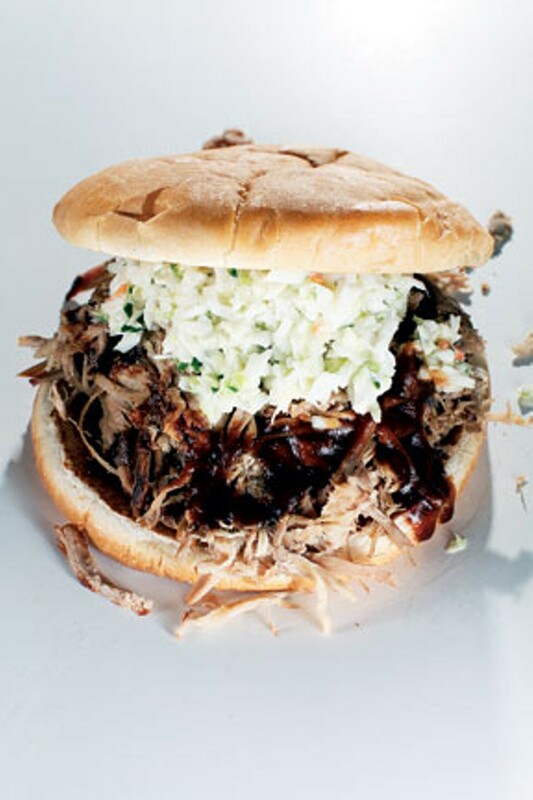 And, to the familiar litany of questions all pork sandwich lovers must confront — pulled or chopped? hot or mild? slaw or no slaw? — the Bar-B-Q Shop has added one of its own: bun or toast? The Bar-B-Q Shop gives diners the option of having its sandwich on a traditional bun or lightly toasted Texas toast — the latter option seems to be more popular. For what it's worth, our judges were split on their orders — four went with the toast, four chose a bun — and the scores were equally high from both groups. But the toast contingent was particularly pleased by both the appearance and texture of their sandwiches. However, one judge noted: "Texas toast makes a sturdy sandwich but only if you eat it right away. Over time, the bottom gets soggy and falls apart. Buns may be more practical." This toast partisan's translation: If you're getting a Bar-B-Q Shop sandwich to go, you might want to get it on a bun. But if you're eating in? Toast! As one voter summed it up: "It's a delicious sandwich." After being scored by eight judges and with 400 points available, only a half-point separated second-place Payne's from third-place Germantown Commissary. But despite similar cumulative scores, these are very different places and very different sandwiches. If the Bar-B-Q Shop's sandwich brought our judges together, Payne's and Germantown Commissary tore us apart, each inspiring ardent supporters, some ambivalence, and at least one outright detractor. Both sandwiches garnered multiple scores greater than 43 (which was the Bar-B-Q Shop's high score), but each also got a score down in the 20s (lower than any score from fourth- and fifth-place finishers Central and Corky's). Payne's is a distinctive sandwich from a distinctive place. A humble, dimly lit converted filling station on Lamar, along the Midtown/Orange Mound border, it's mostly a takeout operation, with a few tables scattered about. Some 'cue connoisseurs liken standing at Payne's counter to making an offering to the barbecue gods, but at least a couple of our judges were unimpressed with what one called the "dingy and dirty" atmosphere. "It has a tart vinegar flavor," wrote one judge, who got his sandwich mild. "Heat hits at the beginning, the other flavors fill in after. I personally prefer thicker, more tomato-y sauces, but this is still good." A couple of judges noted that the mild sauce is a little too "sweet and sour," while the judges most impressed by Payne's sauce (two perfect 10 scores) went with the heat. "Hot is the way to go here," one judge wrote. 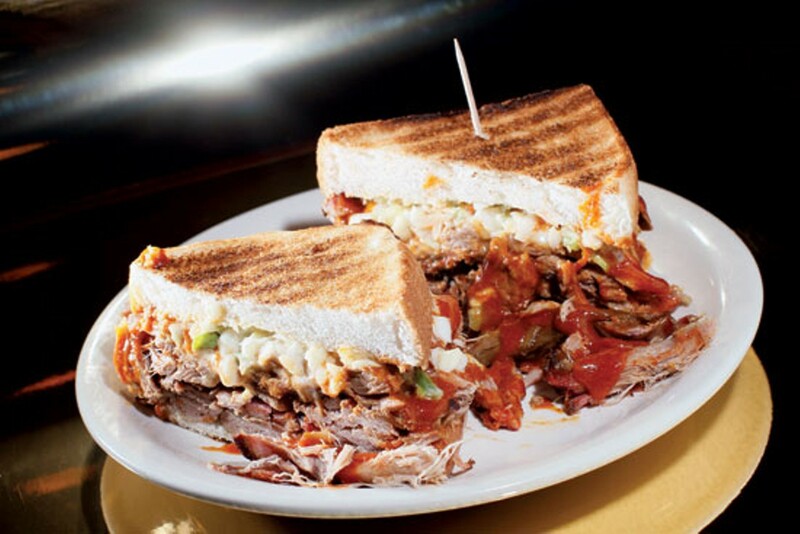 Another distinctive feature of the Payne's sandwich is that rather than the finely chopped, hash-like texture of some sandwiches or the large-chunk pulled style of others, Payne's sandwiches are coarsely chopped and with plenty of the crunchy outer layer of the pork shoulder included. This drew a mixed reaction from our judges. "It's chopped but not over-chopped," one judge noted approvingly. "Lets you spend a little time with the mildly smoky meat." Another judge was intrigued by the bits of crisp coinciding with tender chunks of pork, writing that the crisp parts "pop like little fireworks in your mouth." But a couple of judges complained about too much fat and/or gristle in their sandwich. "This one feels bold and brash. My mouth is on fire (in a good way)," one judge wrote. Another, speaking for a few judges who had a mixed reaction, wrote, "Definitely a very different kind of BBQ sandwich." A bustling, inviting family eatery in idyllic old Germantown, the Germantown Commissary is a quaint place, but it serves up a sandwich that is impressive and imposing, finishing with the highest score in both our "appearance" and "construction" categories. "Bigger than other jumbos," one judge noted, appreciatively. "It holds together like a champ," another enthused. "You could juggle these. Amazing construction." "The rare sandwich that doesn't require a third hand," another wrote. This is a big sandwich, with big, tender chunks of pulled pork, but even some fans thought the pork could have had a bit more flavor: "The meat is moist, supple, but maybe a little bland." "The sauce is thick, dark. Tomato-y, with sugar and smoke, but not too spicy," one judge wrote, another labeling the Commissary sauce "kind of addictive." But these were minority opinions. Germantown Commissary got the lowest sauce score of our final five, with multiple judges complaining that the sauce is too mild. "It tastes like a watered-down mix of molasses and tomato sauce," one judge complained. "It's not too sweet, but it needs more spice or vinegar (or both). It's very bland. So much so that it sinks an otherwise fine sandwich." Another judge, who scored the Commissary sandwich strongly across the board, offered an enthusiastic counterpoint: "Wow! I have to give it a 'wow.'" Central BBQ's pulled-pork sandwiches show up with the top bun askew, revealing a nice mound of pork topped by a smattering of bright, peppery sauce. It's an inviting sandwich and our judges were generally pleased by the core components — the meat and the sauce. Central got the highest meat score in our final five (although the scores in this category were all pretty close together), praised as "tender" and "juicy" by multiple judges. And though no one fell in love with Central's primary sauces (one judge noted that the optional "mustard/vinegar" sauce is superior to the standard mild) the way many judges did with the Bar-B-Q Shop or Payne's, Central got decent sauce scores. "A good hint of spice without being too sweet," noted one judge, offering a common opinion. Central's problem was in the construction. One group of judges described a sandwich that falls apart too easily. "Central's large sandwich (pulled) looks like the barbecue sandwich of your dreams — overflowing with perfectly sauced chunks of meat," one of these judges wrote. "Then you eat it and it falls to pieces. This is an eight-napkin sandwich." Another couple of judges, who scored Central on the same day, both remarked on buns that were too dry and too thick, detracting from the quality ingredients inside. Corky's was a sandwich that every judge seemed to enjoy but that no one could really get excited about, its tender, smoke-laced meat drawing the most compliments. "A solid sandwich," one judge wrote, speaking for most. "A standard you can rely on." The 12 sandwiches we judged and where you can get them.